Most of us tend to get up at the last minute in the morning and we don’t necessarily have all the time in the world to get ready. We tend to take care of the necessary items, making sure that we look acceptable when we leave the door. This also includes doing something with our hair, but many of us tend to leave it to chance. If you’re somebody that has long hair and enjoys looking your best in the morning and throughout the day, you might want to consider wearing a ponytail. Of course, I’m not talking about just any ponytail, when you know how to do it right, it can really add a lot of style and creativity to your overall look. That is what Kaylee Melissa is helping us to see. She shows us 7 different ponytails to try so that we have a different hairstyle for every day of the week. Make a circle around the top of the head and section the hair into a ponytail. Hide the elastic band by wrapping your hair around it; then gather the rest of the hair into a separate ponytail. This ends up causing a nice effect of a ponytail within a ponytail. Put your hair into a high ponytail and secure it with elastics, being sure to loosen up the hair. 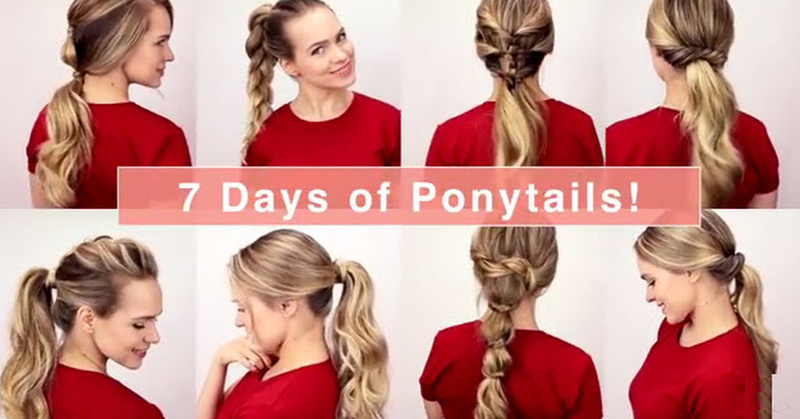 Braid the ponytail to the end then loosen it up to give it a casual look. Begin with a large batch of your hair from the front of the head on both sides. Tie it back is if you are going to half up style and then flip this small pony a couple of times backward to create a twisted look. Do the same thing two more times with two lower sections of your hair to create a layered, twisted look. Begin with a large batch of hair from the left side of the face and pull it into a ponytail. Pull towards the hair that is left out backward, loosening on occasion to add volume. Wrap it around the hairband and clip it underneath to keep it in place. If you want to do something a little off the beaten path, this is the way to do it. Braid the top layer of hair backward and pull up the entire hair, including the braid into a high ponytail. It’s effortless but it looks fantastic. This look goes perfect at any time of the day. Pull the top layer into a pony, pulling at the crown to give it extra volume. Flip it over your head so you can make a second ponytail with the remaining hair and combine it with the first. Bring two pieces of hair from the front of your head around the back and twist them around the bulk of the hair. Keep it secured with a clip. Repeat until all hair has been knotted.